Tourist Information Walk 5 at Breydon Water & Burgh Castle01493 846346work Walking RouteThe Breydon Water & Burgh Castle Walk is a 8.5 mile (13.7 kilometre) circular walk starting at the Burgh Castle Roman Fort car park in Burgh Castle near Great Yarmouth. A countryside and riverside walk with vast skylines and reed-choked marshes. 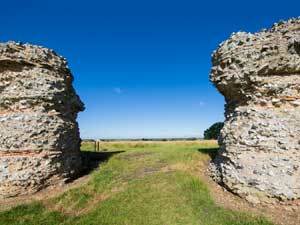 Explore the English Heritage site at Burgh Castle and discover the remains of a roman fort along the way. There are no public facilities or shelter along this route. Opportunities are limited for refreshments outside of the summer months but are available in the surrounding villages.